The Vanderbilt family is synonymous with wealth. So it is hard to imagine that the Vanderbilt fortune started with a borrowed $100. Jan Aertsen van der Bilt immigrated from Holland to America around 1650. His descendents were all content to be farmers on Staten Island. They all lived a good and modest life, satisfied with their linage of agriculture. Island had a vision. From a young boy, he worked on his father's New York Harbor ferry and at age 11 quit school. At age 16 Cornelius had a dream and borrowed $100 from his mother to buy a small sailing vessel with which he planned to start his own ferry business. By the end of the first year he operated three ferries beginning the Vanderbilt opulence. Cornelius became the first Vanderbilt associated with wealth. An entrepreneur and a man that could envision the future, Cornelius saw the advantages of steamships, adding to his fortune. He became known as the Commodore because of his determination and his strong will to succeed. This success allowed him to move from New York City back to Staten Island and into a significant residence. lines between New York and the Great Lakes. In 1869, only a year after the death of his wife, Cornelius married Miss Frank Crawford. A very generous man, the Commodore believed strongly in supporting worthy causes. Influenced by his wife, Frank, Cornelius donated $1,000,000 to the Central University of Nashville. Because of his generous donation the school was renamed Vanderbilt University. Cornelius and his first wife, Sophia, had 13 children, 37 grandchildren and 27 great-grandchildren. The astute owner of a $100 million estate, the Commodore was the wealthiest entrepreneur of his time. He left most of his estate to his eldest son, William Henry who had the Biltmore House designed and built in Ashville, North Carolina. Come back next month to read what prompted William to built the castle set in the Appalachian mountains. 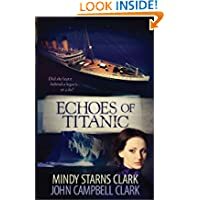 I'm giving away Echos of the Titanic by Clark and Clark. Leave a comment or tell me about a dream you have to be entered. Don't forget to leave your email address so I can contact you should you win! Good luck! Loved this post! I want to know why he picked the Appalachian Mountains as the place to build. The Biltmore House is close by, but I don't know the history. Thanks for the chance to win a copy of Echoes of Titanic! Sounds like a great book! Thanks for coming by, Sally. I'm looking forward to writing the second part of this post. The Biltmore and the Vanderbilts have some great history. I can get lost in it all! We only live a couple hours from the Biltmore. It is a beautiful setting up there. Do you live in the Appalachian Mountains then? I'm very jealous! LOL Good luck with the drawing and again thanks for coming by! Yes, we live in Southwest Virginia. It is beautiful here! The leaves are starting to change. Thanks! I read Echoes of the Titanic and loved it. Read it almost as soon as I got home from ACFW. The Vanderbilts have always fascinated me.Thanks for giving us some insight into the man and his fortune. Thanks Martha. This was a really fun post to do. I suppose it helps that I don't live that far from there and have visited many times. Thank you for coming by, Paula. Cornelius was an amazing man when you think about where he came from and the vision he had. He always was looking for another way to improve or add to his wealth. Quite the entrepreneur. Such wealth from such humble beginnings. It just goes to show an industrious person can go far in the world. I learned a lot about the Vanderbilt family. Interesting post! Debbie, I've toured the Biltmore house several times and each time am fascinated by its history. Thanks for explaining how the Vanderbilts got their money to begin with. I look forward to reading your next blog. Thank you Marilyn. I love touring the house. I've never been there at Christmas time but I sure would like to! I loved learning about the beginnings of the Vanderbilt fortune and look forward to reading next month's post! I have toured Biltmore House and find it fascinating and certainly hope to visit again one day. Such history and beauty to behold! Thank you for the opportunity to win a copy of ECHOES OF TITANIC! Thanks for coming by, Britney. I have a couple books that came from the Biltmore House and I have to say they are a lot of fun to read and look at the pictures. I just haven't taken in all that is there when I've gone. So I continue to learn. Good luck! Great post. Thanks! Makes me want to dig in and learn more about this interesting family. Don't you love how people and places bring our history to life? The Biltmore is still on my bucket list! Good for you, Julia! It's a good bucket list place. If you come back by please leave me your email in case you win! This is an interesting post. I would love to visit the Biltmore one day. Thank you for the chance to win. Good Luck Angela! Yes you must visit I'd venture to say there is none like it in America. It will certainly wow you! It does me every time I go. Thanks for coming by, Sharon, and good luck! It is amazing what a person can do when they put their mind behind it. That is if they aren't afraid of work! I love this post! I have visited the Biltmore House several times and I thoroughly enjoy each time I go. The history and the beauty of this house will live on and on. I look forward to your next blog and thank you for the opportunity to win Echoes of Titanic. The beauty stands alone in this house IMO. It makes one stand in awe and wonder what it would feel like to live there. Can you imagine how the visitors felt? LOL. Good luck. I love the history! Just so interesting to hear about the Biltmore house..thanks for the chance to win. Your welcome, Eliza. I'm glad you enjoyed the post. Interesting family. Good luck! I really enjoyed reading about the Vanderbilt's. It still amazes me how one good idea can set you on a path that could literally change the world! I love history and have been past the Biltmore House but at the time couldn't see it. I am really looking forward to reading more about the history of these families. My dream is to take my grandchildren to as many historical sites as possible because history should be shared so they understand it's signifance in our world. Thank you. What a wonderful goal, Jackie! Your grandchildren will have richer lives because of it. Knowing history can keep us from repeating...or at least should! Thanks for coming by and good luck! $100 and at 16 years old? Wow. I'm so lazy. LOL Maybe I'll encourage one of my kids to do that. ;) Great post, there was a lot I didn't know about Cornelius. I can't wait to read about the Biltmore - love me some castles! LOL! I'm with you, too late for me but if one of my kids could do that I wouldn't mind living in a castle. ;o) Good luck in the drawing and thanks so much for coming by. Thank you! I'm looking forward to writing the rest of the story. While I was reading I saw they had several other homes. Just can't imagine. But it is fun to read about them. Very interesting post! Can't wait to read more. Thank you for the chance to win a copy of Echos of the Titanic. Thank you, Karen. Come back on the 7th to hear the rest of the story. Good luck in the drawing. Gosh, I sure wish I had a dream that could make millions to pass down to all of my descendants by borrowing only $100 from my mother! I've always wanted to see and tour the Biltmore, but had no idea that it was tied to the Vanderbilt family. Thanks for a great post and can't wait for next month's post. And thanks for the chance to win Echoes of the Titanic. Thanks for coming by, Kam. Good luck on the drawing. Vanderbilts were quite a family. And they were very generous to charities, too. Isn't it amazing how Cornelius started out with the $100? He was certainly a motivated young man. I love the Biltmore House and have visited it many times, but never at Christmas. I would enjoy that. Hey Kay! Yes it is amazing. Mind boggling actually! I hear it is breathtaking at Christmas time. I know I'd really like to go then myself. Good luck! Awesome, inspiring story! I would love to visit Biltmore some day. Merry, I hope you are able to visit someday. I'll have some great pictures,next month to entice to go! Good luck in the drawing! Enjoyed learning more about the Vanderbilt family - toured the Vanderbilt mansion, a number of years ago, while living in the Gatlinburg area. Beautiful! Looking forward to your next post about them! Thanks, Debbie!